Moody's Motel doesn't supply a continental breakfast, but it's diner at the bottom of the hill is suppose to have the best blueberry pancakes around, so its down the hill we ride!! However, no one wanted to climb back up that monster again, so it is pack the van, put air in the bike tires, and make those fabulous peanut butter sandwiches first -- then coast down to a warm breakfast. The locals are thinking we are a little different. They seem to have never seen so many mature women in spandex before. We do draw some stares as we enter the local places! After a hearty carbo loading, we are off down US 1 to Damariscotta. The village is nestled on a slope with Main Street all down hill, but with a great Latte Cafe to give the morning a new meaning. 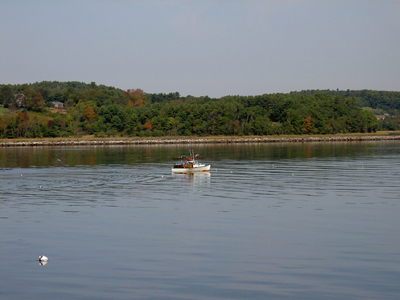 Then across the Damariscotta River and up the hill toward Newcastle. Like yesterday the air is crisp, but warm. Unheard of temperatures have hit this area this fall. With promises of almost 80 degrees today, we start shedding the layers of clothing rapidly. Us 1 is the main route down the coast and as a result has much traffic in the form of not only cars, but trucks, school buses and RVs. Fortunately for our routing, we ride this road only intermittently. Today is not different as we quickly find Old US 1 and duck around the corner and onto a quiet well-to-do residential neighborhood. There is nothing but no traffic and beautiful homes to look at as we coast by . Back out on US 1 but with a great wide shoulder to boot and we once again rise and fall over the terrain. The road is just steep enough to tax the legs, but the downhills give relief and a chance to catch one's breath. We are now inland enough that sight of the sea is gone, but the rivers that flow from the mountains from the north create the perfect spots for inland ports. One such is Wiscasset. Nestled along side the river it now is the home of many antique shops and B&B's. We don't have time to stop and soak it all in, but rather pedal through. Wiscasset being on the river also means that to leave it one has to pedal straight uphill away from the river's bank!! Not too far outside of town the route turns off of US 1 and heads again out over the back country roads. Old Bath Road to Old Stage Road to Woolwich Town Center to Woolwich and across the Kennebec River as its leads us closer to our destination for lunch, Bath. Side note here: we haven't figured quite out why Woolrich Town Center is located a few miles to the east of Woolrich, but think it must be a Maine thing. The town of Bath is an old river port town now restored into a wonderful thriving tourist/resident village. Based on the car traffic on Main Street we are not the only ones who have found this gem. Leaving the river and the town of Bath we head out to link up with a convenient bike path that parallels the US 1 (now major highway). Unfortunately, we miss a turn and now find ourselves totally lost, but each with an idea of which way to go. Left; no right; so let's go north; but we should be headed west; there is Hwy 24; but are we suppose to be on it now? ; --- much confusion so let's ask a local. Now, as much as we are loving Maine, there is something to be said about the way they name their streets. Seems if you are headed in one direction it is named one way --- and if you are coming from the opposite, it is named something else. So if you are a group of bikers from several different states and have no idea which way to go, all the help that can be mustered is needed. Our map said ride Old Brunswick Road to Old Bath Road. Seems that we were on Old Bath if we headed west, but were also on Old Brunswick if we were heading east!!! Very confusing!!! Over the Androscoggin River and on to Brunswick, the home of Bowdoin College we merrily roll along! The town is beautiful and best of all, very biker lane friendly! A lot of lefts, then rights and finally we are on the home stretch to Freeport, the home of LLBean! Freeport will be our first rest stop with two nights in the same hotel. A quick shower and it is off to see the shops and get dinner before falling into bed. Tomorrow is a "do what you want to do day" for everyone and well earned. Lobster Fishermen on the Way to Their Pots!